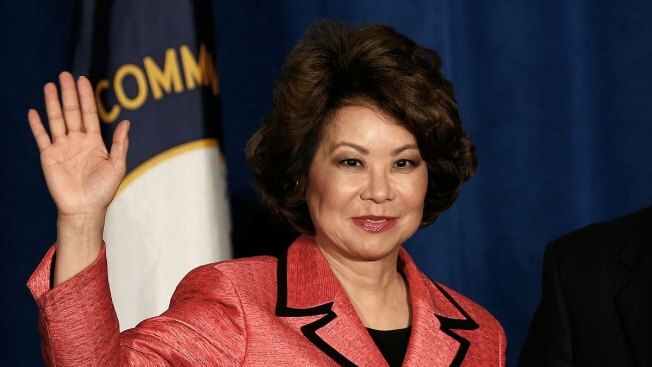 U.S. Transportation Secretary Elaine Chao. Gov. Cuomo is headed to Washington to meet with U.S. Transportation Secretary Elaine Chao amid New York City's ongoing transit troubles. A spokesman for Cuomo has confirmed Wednesday's meeting. Some transit advocates have criticized Cuomo for not doing enough to maintain the city's subways and commuter rail lines. The system has faced mounting derailments, breakdowns and delays in recent months. Summerlong repairs at Penn Station threaten to further disrupt suburban commuter trains and had prompted Cuomo to warn of a "summer of hell" for commuters. The problems have brought about calls for greater federal transit funding, as well as finger pointing between Cuomo and Democratic New York City Mayor Bill de Blasio over whether the city or state should be paying more to fix the system.